contains .1960 of a troy ounce of gold. 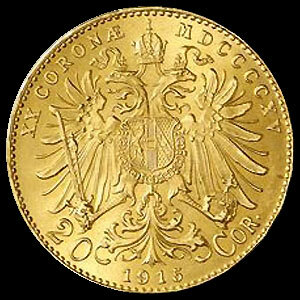 Corona coins are no longer minted in Austria but are still traded and sought after worldwide as one of the best bargains in gold coins because they sell at a very low premium over spot price. Almost all Corona 20 coins feature a 1915 date but are an official re–strike from later dates. 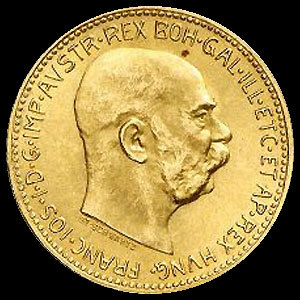 The obverse of the Corona 20 features a bust of Austrian and Hungarian Emperor, Franz Josef I. The coin’s reverse depicts the Coat of Arms of Austria superimposed over a crown imperial double–headed eagle.